How old for Doctor Who? My old high school mate Konrad asked (a little while back now): How old were your boys when you introduced them to Dr Who and do you think it was the right age? I ask as I’m wondering how old my daughter will have to be before I can introduce her to him. I think it was early-2003 when I first bought the DVD of Carnival of Monsters and showed it to Isaac, who was 7 or 8 at the time (Jeremy would have been 5). One of the reasons I chose that story was because the boys were first starting to get interested in visual effects, and amongst the extras on the disc was a demonstration of Colour Separation Overlay (the BBC’s name for chroma key, or blue/green screen), with early-70s producer Barry Letts showing off how to use it. The story was pretty good too, with strange alien blokes, dinosaur-like “Drashigs”, and the Doctor and Jo miniaturised and scurrying through the Scope machine. As I recall it, Jeremy wasn’t particularly interested, but Isaac was. And we dug out The Five Doctors DVD I had. It’s a bit more scary/violent than Carnival of Monsters, and I recall him initially reacting adversely to the massacre of the Cybermen by the Master. I suppose in retrospect it was quite unlike any television or movies he’d watched before then, with the possible exception of Harry Potter. We started buying a few more DVDs, and when in late 2003 the ABC started showing all the classic episodes, Isaac watched it every night. He was hooked. So, for Isaac, seven was the age. Every kid’s different of course, and like anything of this nature, a parental discretion, supervision and guidance will help. 10/1/2010: Which movies are suitable for older kids? As I’ve been a Doctor Who fan since I was little, it was natural that my children very early on watched stories with me, first on VHS and later DVD. Doctor Who was out of production by the time they were born, but they were quickly hooked. My eldest encountered a Dalek at a school fair when she was four and got one hell of a fright. All three of them sit glued to the revived series and my youngest regularly dips into my vast DVD collection for older stories. 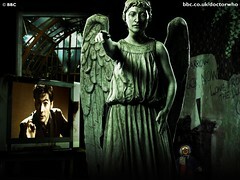 Incidentally, Blink, the episode in your picture, is, in my opinion, the best and scariest episode of Doctor Who EVER. Just out of interest – is Jeremy into it now too? @Rae, the new series yes, not the old ones. More importantly Daniel, have you got them watching Trek yet? Get ’em onto it pronto! @Andrew V, we are nearing our run of all the TNG episodes. @Ian, I didn’t choose it by accident! Well as you are pretty much aware Daniel I grew up on Doctor Who (and The Goodies) and I don’t think I can recall not watching it. I doubt very much that my parents bothered to think if it was appropriate for me to watch or not (since it was on so early). Funny you mention Carnival of Monsters because that’s pretty much my earliest Memory of Doctor Who. I was always confused how Ian Marter was in it and then also appeared in later episodes as Harry Sullivan, until much later I grasped the concept that one actor could play more than one character (even in the same program!). However the new series can be much scarier than the old one. Like Ian, Blink had everyone my age I know who watched it absolutely terrified, so I can only imagine how scary it would have been for a kid. Even the spin off of “The Sarah Jane Adventures” has been pretty scary at times, and that’s screened at an even more child friendly time slot in the UK! Thanks for the reply and the discussion. My older daughter is now 6. I imagine her watching the very first new Dr Who episode – Rose – and I think she’d be pretty scared. Blink would definitely have her petrified (if you pardon the pun). I’m going to wait a few more years or she might get turned off it. The most grown-up thing she’s watched thus far is Anne of Green Gables!